You'll start this chapter in Ayla's hut and learn that the northern woods are burning. Head into the woods to find Laruba Village, which the Reptites burned in revenge for Ayla taking back the Gate Key. 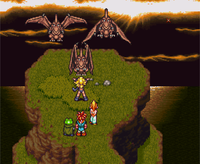 Ayla heads off to the Dactyl Nest to find some dactyls to fly to Azala's lair. Check by the trading hut if you want to buy some new weapons, the best currently available. Go to the Hunting Range if you want to stock up on petals, fangs, horns, and feathers. Trading for Ruby Vests and Rock Helms would be particularly handy, and the weapons for everyone but Frog definitely help. Before you move on, if you want to head back to the end of time there are actually a few things you can do in other time periods. With Marle in your active party, you'll now be allowed inside the castle, and you can even visit your lawyer Pierre, plus there's a scene if you talk to the king. Your sentence will be suspended and the Chancellor will want to be rid of Marle. Go right from the entrance and go up for one HyperEther. There is also another chest upstairs of this chest, but it's locked so ignore it for now. On the way to King's Bedroom you will pick up a Elixir and in King's Bedroom is a Full Ether. On the way to Marle's Room is a HyperEther and in Marle's Room is a MegaElixir. To see how far apart Marle and her father is, buy the Jerky and give it to the king. What happens next? He blows up on Marle's face and locked himself in his room. Since when does the king have high cholesterol problems? Well it will be a long time until Marle and father is back together again. On 600 AD, everyone will thank you for defeating Magus; Frog in particular will be recognized at the castle. One other note is that if you go to Medina Village in the present, the villagers will all worship a statue of Ozzie instead of Magus. Enter the Dactyl Nest when you're ready. The monsters here shouldn't be that tough after Magus's castle, kill the rocks if you want to keep the apes from counterattacking, and finish off one rock at a time so they don't attack you once they wake up. Climb up and get Mid Ether from the chest and go around to 3 Shists. Pick up Mid Tonic and go to the next area right. On the way to the cliff you'll pick up Meso Mail. When you reach the top you'll grab some Dactyls with Ayla and be in the next chapter. If you go back and challenge Lavos at this point, you should get The Reptite Ending. You'll wake up at the start of the game where everyone is a reptite, including yourself. Presumably without your help Ayla wouldn't have been able to defeat the Black Tyrano on her own and Reptites would have ruled the past. This page was last edited on 17 April 2013, at 04:46.